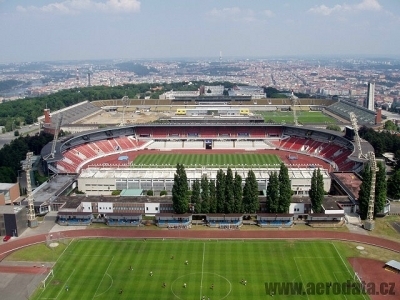 The Strahov Stadium contains 9 football pitches and is the training centre for Sparta Prague. Map showing the location of Strahov Stadium in Czech Republic. It was meant as gymanstic and athletic stadium about 100 years ago. The problem was that communists used it as propaganda after 1945. So in 1989 after revolution, it was disused because of the hate to everything connected to communism. Than to use it they split it into small fields so it would be used at least for something. It has seating for 220-250.000 people originialy. But remember it was not meant as football stadium. it look good and smart. Its the arena capacity, however, there is 9 pitches inside the arena. It was used for "spartakiadas" during socialism era. You have the ability to request en edit to any of the details of Strahov Stadium. You can do this by clicking on one of the options below.